Best Offline Dictionary App For Android 2017, एंड्राइड फ़ोन के लिए बेस्ट डिक्शनरी. Best Offline English Dictionary for Android No INTERNET required. Just download and find the meanings. Everyone needs a dictionary because at some or the phase we come across words that we have not heard before so probably we don't know their meaning. 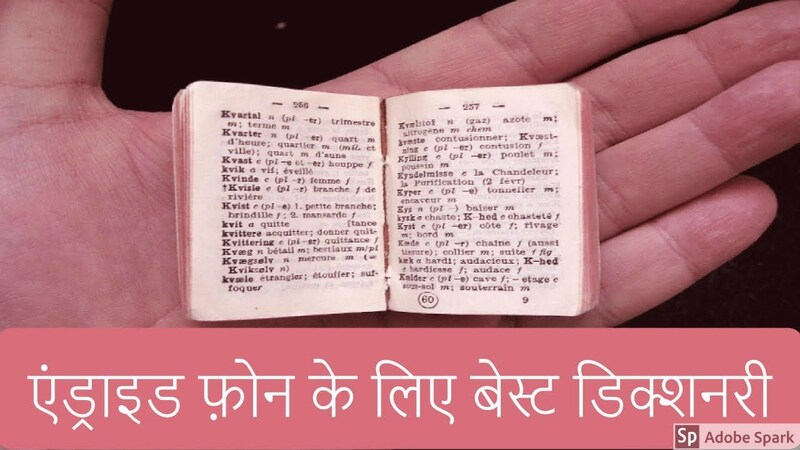 And in situations when we don't have INTERNET facility available, Offline Dictionary can be a boon. So it's better to always keep the best offline English dictionary on our smartphone and please don't forget to Like, Share, Comment and Subscribe to our Techno Vedant Channel for more videos. Now you can translate words quickly by using the camera. Camera Translation. Google Play’s Best Self-Improvement App & Best App of 2016! U-Dictionary works great Offline too. You can download offline packs for 38 International languages, Collins Advanced Dictionary, WordNet Dictionary and English Sample Sentences. You can use U-Dictionary without internet. Also, the installation package is only 17Mb. U-Dictionary is not only the largest English Offline Dictionary but is also the best app for language reference, English learning and vocabulary building. U-Dictionary is the best companion for all your English language needs! Odia Dictionary: You can download offline pack for Odia now. Camera Translation: Translate words quickly by using the offline OCR technology. Word Lock Screen: Show words you choose on Lock Screen without a network by accessing the offline package. Quick Search on Lock Screen: Search words or sentences on the lock screen, no need to unlock your phone. Copy to Translate: Copy any word or sentence while browsing, messaging, or reading news, to get meaning instantaneously. Quick Translate: Get the meaning in the notification bar without opening U-Dictionary. Offline Dictionary: 38 Languages and synonyms, antonyms, phrases, cognate words, English sample sentences, Collins Advanced Dictionary and WordNet Dictionary. The word for Today：Learning a new word every day. Small Installation Package: Only 17MB. 14 Display Languages: Now you can read in your native language. Perfect English Pronunciation: Authentic UK (British) and US (American) accent. Roman Script: U-Dictionary provides Roman script for basic definition to help you pronounce. Sample Sentences: Collected from famous international news websites such as BBC, NPR, etc. Speech Recognition: Speak the word and get the meaning. My Words: Save important words into different folders. English Articles: Useful Articles to read. English Arabic Dictionary, English Bangla Dictionary, English Chinese Simplified Dictionary, English Chinese Traditional Dictionary, English Dictionary, English Filipino Dictionary, English French Dictionary, English German Dictionary, English Gujarati Dictionary, English Hausa Dictionary, English Hindi Dictionary, English Igbo Dictionary, English Indonesian Dictionary, English Italian Dictionary, English Japanese Dictionary, English Kannada Dictionary. English Khmer Dictionary, English Korean Dictionary, English Lao Dictionary, English Malay Dictionary, English Malayalam Dictionary, English Marathi Dictionary, English Nepali Dictionary, English Pashto Dictionary, English Portuguese Dictionary, English Punjabi Dictionary, English Russian Dictionary, English Sindhi Dictionary, English Spanish Dictionary, English Swahili Dictionary, English Tamil Dictionary, English Telugu Dictionary, English Thai Dictionary, English Turkish Dictionary, English Urdu Dictionary, English Vietnamese Dictionary & English Yoruba Dictionary.